Before Acorn Interactive came on the scene, Casa Hererra's search engine ranking was non-existent and there were no inquiries coming in from the site. 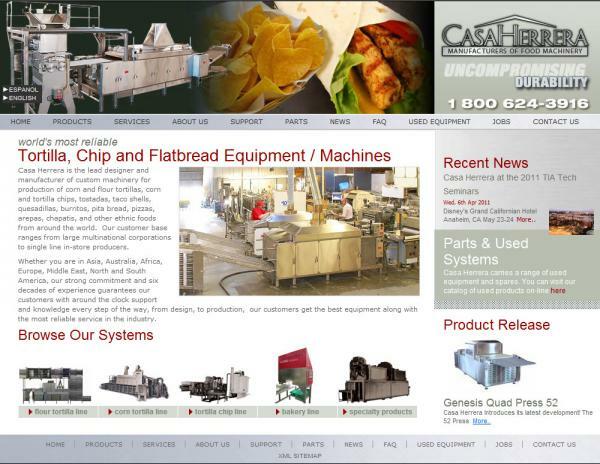 Furthermore the site did nothing to show the company as the world-class flat bread and tortilla manufacturer that it is. Acorn Interactive developed a strategy incorporating brand development and website redesign. Using a multi-lingual content management system that incorporated the development of several product software modules makes it easy for the company to showcase its ever expanding product line with product descriptions, specifications, brochures, videos and images. There were nearly 30 business inquiries in just the first month of launch and Acorn Interactive had to soon develop further qualifying aspects into the site so that the most valuable inquiries were escalated.